I was working away on finishing my sandwiches for pictures in the kitchen and it hit me – the most intense and wicked craving for ramen – EVER! This was not completely out of the blue. Last night Jason and I were talking about ramen and other horrible things we used to eat, so the seed was planted in my brain. 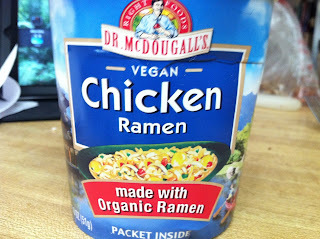 I went into our pantry, which is the best stocked vegan grocery store in the area. 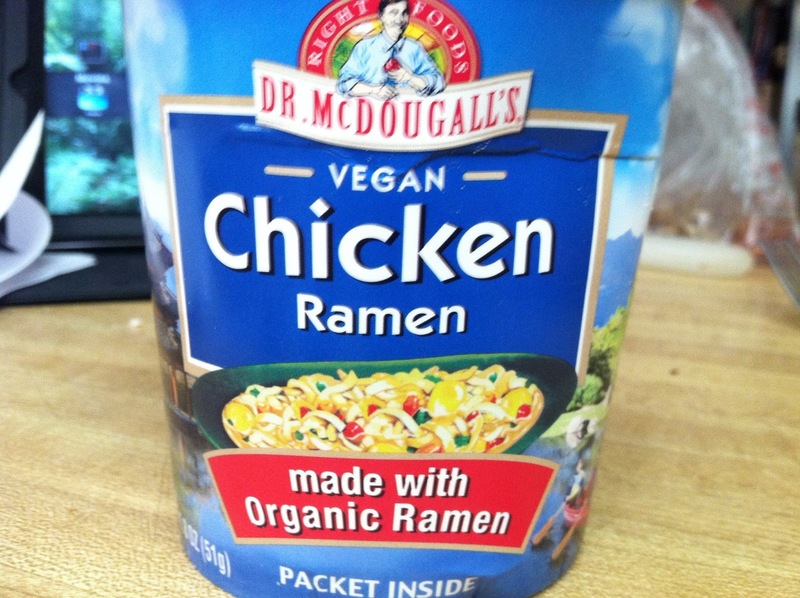 There, I found a cup of Dr. McDougall’s Vegan Chicken Ramen that I purchased on an earlier travel adventure. These cups are a healthier version of the traditional cup of noodles that got many of us through high school and college. Based on previous experience with this line, I also grabbed the salt shaker. Dr. McDougall is a champion of good health and would probably frown with me over salting is soup, but if you are having a junk food craving, you’re having a junk food craving. I waited with some great anticipation. After all, this was either going to be really good or really bad. In the meantime, I calculated the WW Points per cup (4 points if anyone else cares) and waited for my noodles to cook once I added the boiling water. After adding a pinch of salt, the result was magical. This tasted exactly like chicken – so much so that I think it would fool people who still were meat eaters, and made my own vegan self check the label again with a ‘is this vegan?’ moment. 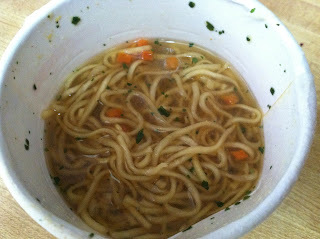 The bright intense flavor and the starch of the noodles was magical. I ate it all and my craving for ramen went away, filed under ‘satisfied’. In this, there are 200 calories, 8 grams of protein and 2 grams of fiber. My biggest gripe is that the label says there are two servings inside. Who are they fooling? This cup is about 1 ½ cups, but not enough to share. I have noticed that some people, especially some of the vegan doctors prescribe bird size portions of food that would not satisfy a kiddo as a way of keeping calorie and fat count low. Maybe it’s just me, but this cup was perfect. Half would not have made me feel full or happy. That being said, I love the portability of this product. After the “Great New York Starvation” I always travel with two of these McDougall soup cups. Because they are dry inside and light, they are perfect for carryon luggage. If you are on a long flight you can get hot water for tea and pour it inside – instant meal! So with a little salt and the understanding that you are going to eat the whole thing, I love this product. This is something I will seek out and buy in the future. Highly recommended, and 5 out of 5 stars. Confessions and Salads, with TWO RECIPES!! Cooling Off - Coconut Chai with a recipe!